A landspout near North Platte, Nebraska on May 22, 2004. Note the characteristic smooth, tubular shape, similar to that of a waterspout. "Colloquial expression describing tornadoes occurring with a parent cloud in its growth stage and with its vorticity originating in the boundary layer. The parent cloud does not contain a preexisting mid-level mesocyclone. 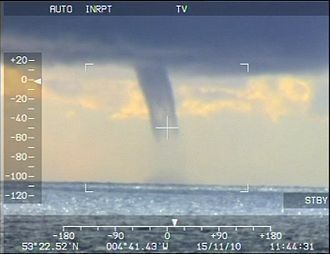 The landspout was so named because it looks like "a weak Florida Keys waterspout over land." Landspouts are a type of tornado which forms during the growth stage of a cumulus congestus cloud by stretching boundary layer vorticity upward and into the cumulus congestus's updraft. They generally are smaller and weaker than supercell tornadoes and do not form from a mesocyclone or pre-existing rotation in the cloud. Because of this, landspouts are rarely detected by Doppler weather radar. 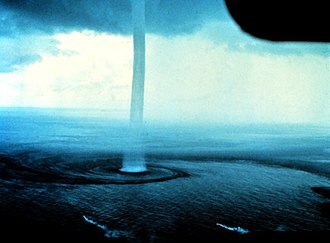 Landspouts share a strong resemblance and development process to that of waterspouts, usually taking the form of a translucent and highly laminar helical tube. Landspouts are considered tornadoes since a rotating column of air is in contact with both the surface and a cumuliform cloud. Not all landspouts are visible, and many are first sighted as debris swirling at the surface before eventually filling in with condensation and dust. Landspouts are commonly weak, however, in rare occasions, a landspout can be as strong as an F3 tornado. ^ Bluestein, Howard B. (1985). "The formation of a "landspout" in a "broken-line" squall line in Oklahoma". Preprints, 14th Conf. on Severe Local Storms, Indianapolis, American Meteorological Society. pp. 267–270. Retrieved 27 March 2007. ^ American Meteorological Society (2000). "Glossary of Meteorology, Second Edition". ametsoc.org. Retrieved 27 March 2007. ^ Wakimoto; Wilson (1989). "Non-supercell Tornadoes". Monthly Weather Review. 117: 1113–1140. Bibcode:1989MWRv..117.1113W. doi:10.1175/1520-0493(1989)117<1113:NST>2.0.CO;2. ^ a b Forbes; Wakimoto (1983). "A Concentrated Outbreak of Tornadoes, Downbursts and Microbursts, and Implications Regarding Vortex Classification". Monthly Weather Review. 111: 220–235. Bibcode:1983MWRv..111..220F. doi:10.1175/1520-0493(1983)111<0220:ACOOTD>2.0.CO;2. ^ National Weather Service. "EF-0 Landspout Tornado near Grand Junction, MI, on June 30, 2017". Retrieved 20 March 2018. 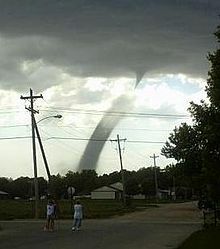 Wikimedia Commons has media related to landspout. Extratropical cyclones are capable of producing anything from cloudiness and mild showers to heavy gales, thunderstorms and tornadoes. These types of cyclones are defined as large scale low pressure systems that occur in the middle latitudes of the Earth. In contrast with tropical cyclones, extratropical cyclones produce rapid changes in temperature and dew point along broad lines, called weather fronts, the term cyclone applies to numerous types of low pressure areas, one of which is the extratropical cyclone. The descriptor extratropical signifies that this type of cyclone generally occurs outside the tropics and they are termed mid-latitude cyclones if they form within those latitudes, or post-tropical cyclones if a tropical cyclone has intruded into the mid latitudes. Weather forecasters and the public often describe them simply as depressions or lows. Terms like frontal cyclone, frontal depression, frontal low, extratropical low, non-tropical low, Extratropical cyclones are classified mainly as baroclinic, because they form along zones of temperature and dewpoint gradient known as frontal zones. They can become barotropic late in their cycle, when the distribution of heat around the cyclone becomes fairly uniform with its radius. Extratropical cyclones form anywhere within the regions of the Earth. 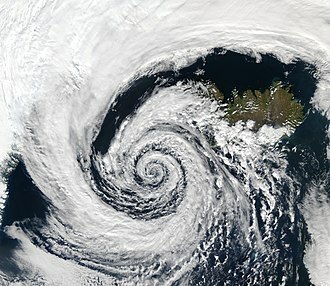 A study of extratropical cyclones in the Southern Hemisphere shows that between the 30th and 70th parallels, there are an average of 37 cyclones in existence during any 6-hour period, a separate study in the Northern Hemisphere suggests that approximately 234 significant extratropical cyclones form each winter. Extratropical cyclones form along linear bands of temperature/dewpoint gradient with significant vertical wind shear, cyclogenesis, or low pressure formation, occurs along frontal zones near a favorable quadrant of a maximum in the upper level jetstream known as a jet streak. The favorable quadrants are usually at the rear and left front quadrants. The divergence causes air to rush out from the top of the air column and this in turn forces convergence in the low-level wind field and increased upward motion within the column. A derecho is a widespread, long-lived, straight-line wind storm that is associated with a land-based, fast-moving group of severe thunderstorms. Derechos can cause hurricane-force winds, heavy rains, and they may occur at any time of the year and occur as frequently at night as during the daylight hours. Derecho comes from the Spanish word in adjective form for straight, organized areas of thunderstorm activity reinforce pre-existing frontal zones, and can outrun cold fronts. The resultant mesoscale convective system forms at the point of the best upper level divergence in the pattern in the area of best low level inflow. The convection moves east and toward the equator into the warm sector, when the convection is strong linear or curved, the MCS is called a squall line, with the feature placed at the leading edge of the significant wind shift and pressure rise. Derechos are squall lines that are bow- or spearhead-shaped on weather radar and, squall lines typically bow out due to the formation of a mesoscale high pressure system which forms within the stratiform rain area behind the initial line. This high pressure area is formed due to strong descending motion behind the squall line, the size of the bow may vary, and the storms associated with the bow may die and redevelop. Warm season derechos in the Northern Hemisphere form in west to flow at mid levels of the troposphere with moderate to high levels of instability. Derechos form within environments of low-level warm air advection and significant low-level moisture and its common definition is a thunderstorm complex that produces a damaging wind swath of at least 250 miles, featuring a concentrated area of convectively-induced wind gusts exceeding 50 knots. Some studies add a requirement that no more two or three hours separate any two successive wind reports. Derechos typically possess a high or rapidly increasing forward speed and they have a distinctive appearance on radar with several unique features, such as the rear inflow notch and bookend vortices, and usually they manifest two or more downbursts. There are four types of derechos, Serial derecho – This type of derecho is usually associated with a deep low. A supercell is a thunderstorm that is characterized by the presence of a mesocyclone, a deep, persistently rotating updraft. For this reason, these storms are referred to as rotating thunderstorms. Of the four classifications of thunderstorms, supercells are the overall least common and have the potential to be the most severe, supercells are often isolated from other thunderstorms, and can dominate the local weather up to 32 kilometres away. Supercells are often put into three types, Low-precipitation, and High-precipitation. LP supercells are found in climates that are more arid, such as the high plains of the United States. Supercells are usually isolated from other thunderstorms, although they can sometimes be embedded in a squall line. Typically, supercells are found in the sector of a low pressure system propagating generally in a north easterly direction in line with the cold front of the low pressure system. Because they can last for hours, they are known as quasi-steady-state storms, supercells have the capability to deviate from the mean wind. If they track to the right or left of the wind, they are said to be right-movers or left-movers. Supercells can sometimes develop two separate updrafts with opposing rotations, which splits the storm into two supercells, one left-mover and one right-mover, supercells can be any size – large or small, low or high topped. They usually produce copious amounts of hail, torrential rainfall, strong winds, supercells are one of the few types of clouds that typically spawn tornadoes within the mesocyclone, although only 30% or fewer do so. Supercells can occur anywhere in the world under the weather conditions. The first storm to be identified as the type was the Wokingham storm over England. Browning did the work that was followed up by Lemon. Supercells occur occasionally in many other regions, including eastern China. The areas with highest frequencies of supercells are similar to those with the most occurrences of tornadoes, see tornado climatology and Tornado Alley. The current conceptual model of a supercell was described in Severe Thunderstorm Evolution and Mesocyclone Structure as Related to Tornadogenesis by Leslie R.
A microburst is a small downdraft that moves in a way opposite to a tornado. Microbursts are found in strong thunderstorms, there are two types of microbursts within a thunderstorm, wet microbursts and dry microbursts. They go through three stages in their cycle, the downburst and cushion stages, a microburst can be particularly dangerous to aircraft, especially during landing, due to the wind shear caused by its gust front. A microburst often has high winds that can knock over fully grown trees and they usually last from a couple of seconds to several minutes. Fujita coined the term macroburst for downbursts larger than 4 km, a distinction can be made between a wet microburst which consists of precipitation and a dry microburst which typically consists of virga. Microbursts are recognized as capable of generating wind speeds higher than 75 m/s, Microbursts have been called air bombs. When rain falls below the base or is mixed with dry air, it begins to evaporate. The cool air descends and accelerates as it approaches the ground, when the cool air approaches the ground, it spreads out in all directions and this divergence of the wind is the signature of the microburst. 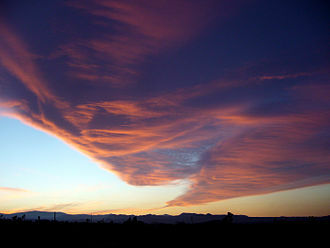 High winds spread out in type of pattern showing little or no curvature are known as straight-line winds. Wet microbursts are downbursts accompanied by significant precipitation at the surface which are warmer than their environment and these downbursts rely more on the drag of precipitation for downward acceleration of parcels than negative buoyancy which tend to drive dry microbursts. As a result, higher mixing ratios are necessary for these downbursts to form, melting of ice, particularly hail, appears to play an important role in downburst formation, especially in the lowest 1 km above ground level. These factors, among others, make forecasting wet microbursts a difficult task, the evolution of downbursts is broken down into three stages, the contact stage, the outburst stage, and the cushion stage. The virtual temperature correction usually is small and to a good approximation. In some storms this term has an effect on updrafts but there is not much reason to believe it has much of an impact on downdrafts. Graupel, called soft hail or snow pellets, is precipitation that forms when supercooled droplets of water are collected and freeze on falling snowflakes, forming 2–5 mm balls of rime. The term graupel comes from the German language, the METAR code for graupel is GS. Under some atmospheric conditions, snow crystals may encounter supercooled water droplets and these droplets, which have a diameter of about 10 µm, can exist in the liquid state at temperatures as low as −40 °C, far below the normal freezing point. Contact between a crystal and the supercooled droplets results in freezing of the liquid droplets onto the surface of the crystal. This process of growth is known as accretion. Crystals that exhibit frozen droplets on their surfaces are referred to as rimed. When this process continues so that the shape of the snow crystal is no longer identifiable. Graupel was formerly referred to by meteorologists as soft hail, graupel is easily distinguishable from hail in both the shape and strength of the pellet and the circumstances in which it falls. Ice from hail is formed in hard, relatively uniform layers, graupel forms fragile, oblong shapes and falls in place of typical snowflakes in wintry mix situations, often in concert with ice pellets. Graupel is fragile enough that it will fall apart when touched. However, observations of snow crystals with a scanning electron microscope clearly show cloud droplets measuring up to 50 µm on the surface of the crystals. The rime has been observed on all four forms of snow crystals, including plates, columns. As the riming process continues, the mass of frozen, accumulated cloud droplets obscures the form of the snow crystal. Graupel commonly forms in high-altitude climates and is denser and more granular than ordinary snow, due to its rimed exterior. Macroscopically, graupel resembles small beads of polystyrene, the combination of density and low viscosity makes fresh layers of graupel unstable on slopes, and layers of 20–30 cm present a high risk of dangerous slab avalanches. In addition, thinner layers of graupel falling at low temperatures can act as ball bearings below subsequent falls of more stable snow. A dust devil is a strong, well-formed, and relatively long-lived whirlwind, ranging from small to large. The primary vertical motion is upward, Dust devils are usually harmless, but can on rare occasions grow large enough to pose a threat to both people and property. They are comparable to tornadoes in both are a weather phenomenon of a vertically oriented rotating column of wind. Most tornadoes are associated with a larger parent circulation, the mesocyclone on the back of a supercell thunderstorm, Dust devils form as a swirling updraft under sunny conditions during fair weather, rarely coming close to the intensity of a tornado. In the southwestern United States, a dust devil is called a dancing devil. In Death Valley, California, it may be called an auger or a dust whirl. The Navajo refer to them as chiindii, ghosts or spirits of dead Navajos, if a chindi spins clockwise, it is said to be a good spirit, if it spins counterclockwise, it is said to be a bad spirit. The Australian English term willy-willy or whirly-whirly is thought to derive from Yindjibarndi or a neighbouring language, in Aboriginal myths, willy-willies represent spirit forms. They are often quite scary spirits, and parents may warn their children if they misbehave. There is a story of the origin of the brolga in which a bad spirit descends from the sky and captures the young being, in Saudi Arabia, Kuwait and Jordan, they often reach hundreds of meters in height and are referred to as djin. Egypt has its fasset el afreet, or ghosts wind, in Iran, this kind of wind is usually called Gerd Baad, or round wind. Among the Kikuyu of Kenya, the dust devil is known as ngoma cia aka, in Brazil, a dust devil is called redemoinho after moinho de vento. In some traditions, it contains a dancing Saci, sometimes it is associated to local religion and beliefs. In Portugal it is known locally as remoinho, Dust devils form when hot air near the surface rises quickly through a small pocket of cooler, low-pressure air above it. If conditions are just right, the air may begin to rotate, the secondary flow in the dust devil causes other hot air to speed horizontally inward to the bottom of the newly forming vortex. A subtropical cyclone is a weather system that has some characteristics of a tropical and an extratropical cyclone. As early as the 1950s, meteorologists were unclear whether they should be characterized as tropical or extratropical cyclones and they were officially recognized by the National Hurricane Center in 1972. Subtropical cyclones began to receive names from the tropical cyclone lists in the North Atlantic, South-west Indian Ocean. There are two currently used for subtropical cyclones. Across the north Atlantic and southwest Indian Ocean, they require central convection fairly near the center, across the eastern half of the northern Pacific, they require a mid-tropospheric cyclone to cut off from the main belt of the westerlies and only a weak surface circulation. Subtropical cyclones have broad wind patterns with maximum sustained winds located farther from the center than typical tropical cyclones and this means that subtropical cyclones are more likely to form outside the traditional bounds of the North Atlantic hurricane season. Subtropical cyclones are observed to form in the South Atlantic. Throughout the 1950s and 1960s, the term semi-tropical and quasi-tropical were used for what would become known as subtropical cyclones, the term subtropical cyclone merely referred to any cyclone located in the subtropical belt near and just north of the horse latitudes. 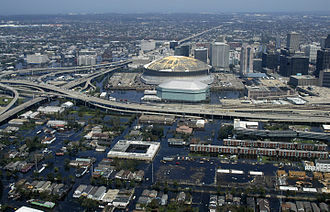 Intense debate ensued in the late 1960s, after a number of hybrid cyclones formed in the Atlantic Basin, in 1972, the National Hurricane Center finally designated these storms as subtropical cyclones in real-time, and updated the hurricane database to include subtropical cyclones from 1968 through 1971. This name was not noted as controversial in contemporary news reports, in the North Atlantic basin, subtropical cyclones were initially named from the NATO phonetic alphabet list in the early to mid-1970s. In the intervening years of 1975–2001, subtropical storms were named from the traditional list and considered tropical in real-time. 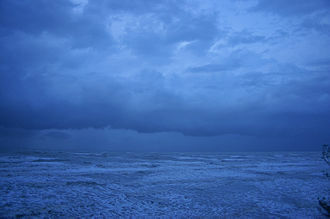 Between 1992 and 2001, two different numbers were given to subtropical depressions or subtropical storms, one for public use, for example, Hurricane Karen in 2001 was initially known as Subtropical Storm One as well as AL1301. In meteorology, a cyclone is a large scale air mass that rotates around a strong center of low atmospheric pressure. A cyclone differs from a hurricane or typhoon only on the basis of location, a hurricane is a storm that occurs in the Atlantic Ocean and northeastern Pacific Ocean, a typhoon occurs in the northwestern Pacific Ocean, and a cyclone occurs in the south Pacific or Indian Ocean. Cyclones are characterized by inward spiraling winds that rotate about a zone of low pressure, the largest low-pressure systems are polar vortices and extratropical cyclones of the largest scale. Warm-core cyclones such as cyclones and subtropical cyclones lie within the synoptic scale. Mesocyclones and dust devils lie within the smaller mesoscale, Upper level cyclones can exist without the presence of a surface low, and can pinch off from the base of the Tropical Upper Tropospheric Trough during the summer months in the Northern Hemisphere. Cyclones have seen on extraterrestrial planets, such as Mars. Cyclogenesis describes the process of formation and intensification. Extratropical cyclones begin as waves in large regions of enhanced mid-latitude temperature contrasts called baroclinic zones and these zones contract and form weather fronts as the cyclonic circulation closes and intensifies. Later in their cycle, extratropical cyclones occlude as cold air masses undercut the warmer air. A cyclones track is guided over the course of its 2 to 6 day life cycle by the flow of the subtropical jet stream. 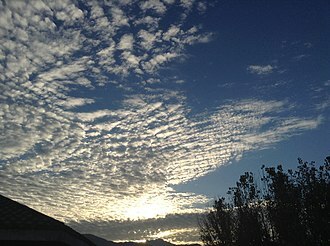 Weather fronts mark the boundary between two masses of air of different temperature and densities, and are associated with the most prominent meteorological phenomena. Strong cold fronts typically feature narrow bands of thunderstorms and severe weather, such fronts form west of the circulation center and generally move from west to east, warm fronts form east of the cyclone center and are usually preceded by stratiform precipitation and fog. Warm fronts move poleward ahead of the cyclone path, occluded fronts form late in the cyclone life cycle near the center of the cyclone and often wrap around the storm center. A haboob is a type of intense dust storm carried on an atmospheric gravity current, known as a weather front. Haboobs occur regularly in arid regions throughout the world, during thunderstorm formation, winds move in a direction opposite to the storms travel, and they move from all directions into the thunderstorm. When the storm collapses, and begins to release precipitation, wind directions reverse, gusting outward from the storm, Haboobs can form when a strong thunderstorm weakens rapidly, and releases a microburst. When this downdraft of cold air, or downburst, reaches the ground, it blows dry, loose silt and clay up from the desert and this wall of dust can be up to 100 km wide and several kilometers in elevation. At their strongest, haboob winds often travel at 35–100 km/h, often rain does not appear at ground level as it evaporates in the hot, dry air. The evaporation cools the air even further and accelerates it. Occasionally, when the rain does persist, it can contain a quantity of dust. Severe cases are called mud storms and respiratory system protection are advisable for anyone who must be outside during a haboob. Moving to shelter is highly advised during a strong event, Haboobs have been observed in the Sahara desert, as well as across the Arabian Peninsula, throughout Kuwait, and in the most arid regions of Iraq. Haboob winds in the Arabian Peninsula, Kuwait are frequently created by the collapse of a thunderstorm, african haboobs result from the northward summer shift of the inter-tropical front into North Africa, bringing moisture from the Gulf of Guinea. 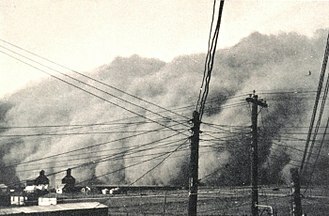 Haboobs in Australia may be associated with cold fronts. As with haboobs in the Arabian Peninsula and Kuwait, the arid and semiarid regions of North America—in fact, any dry region—may experience haboobs. In North America, the most common terms for these events are either dust storm or sandstorm. In the U. S. they frequently occur in the deserts of Arizona, including around the cities of Yuma and Phoenix, in New Mexico, including Albuquerque, in eastern California, and in Texas. A shelf cloud, associated with a heavy or severe thunderstorm, over Swedish island of Öland in the Baltic Sea in July 2005. Desert storms are often accompanied by violent winds, and pass rapidly. Classic summer storm in Sierras de Córdoba, Argentina. Overshooting top of a cumulonimbus viewed from a plane crossing the Democratic Republic of Congo. Airliners typically fly at an altitude ranging from 10 km to 15 km, at the tropopause. Stages of a cumulonimbus cloud's life. Towering vertical cumulonimbus capillatus with anvil-shaped incus supplementary feature. 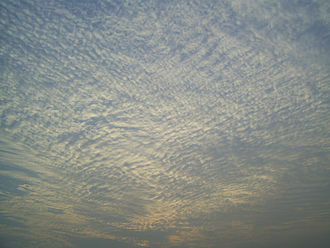 High layer of cirrus spissatus near top of image. Panorama of a strong shelf cloud, a type of arcus cloud. Illustration of a microburst. The air moves in a downward motion until it hits ground level. It then spreads outward in all directions. The wind regime in a microburst is opposite to that of a tornado. A low precipitation supercell shelf cloud. Shelf cloud forms when a cooler air mass under-flows the warmer moisture laden air. A supercell. While many ordinary thunderstorms (squall line, single-cell, multi-cell) are similar in appearance, supercells are distinguishable by their large-scale rotation. A tornado approaching Marquette, Kansas. A tornado near Anadarko, Oklahoma, 1999. The funnel is the thin tube reaching from the cloud to the ground. The lower part of this tornado is surrounded by a translucent dust cloud, kicked up by the tornado's strong winds at the surface. The wind of the tornado has a much wider radius than the funnel itself. This tornado has no funnel cloud; however, the rotating dust cloud indicates that strong winds are occurring at the surface, and thus it is a true tornado. A dust devil in Arizona. A dust devil in Kraków, Poland. A dust devil in Ramadi, Iraq. Dust devil on Mars (MGS). True color satellite image of an unusual anticyclone off southern Australia in the Southern Hemisphere, on September 8, 2012, showing a counter-clockwise rotation around an oval area of clear skies. Hadley cell circulation tends to create anticyclonic patterns in the Horse latitudes, depositing drier air and contributing to the world's great deserts. The subtropical ridge shows up as a large area of black (dryness) on this water vapor satellite image from September 2000. Extratropical cyclones spin clockwise in the Southern Hemisphere, just like tropical cyclones. Conceptual model for a European Windstorm and the associated strong wind "footprints". Note that storm track, footprint locations and footprint sizes vary by case, and that all footprints are not always present. Hurricane Isabel (2003) as seen from orbit during Expedition 7 of the International Space Station. The eye, eyewall, and surrounding rainbands, characteristics of tropical cyclones in the narrow sense, are clearly visible in this view from space. 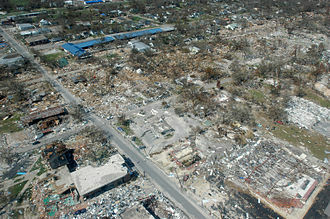 The aftermath of Hurricane Katrina in Gulfport, Mississippi. Three tropical cyclones of the 2006 Pacific typhoon season at different stages of development. 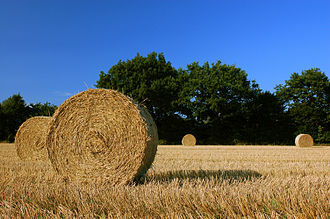 The weakest (left) demonstrates only the most basic circular shape. A stronger storm (top right) demonstrates spiral banding and increased centralization, while the strongest (lower right) has developed an eye. View of one of the Tillamook Burn fires in August 1933. 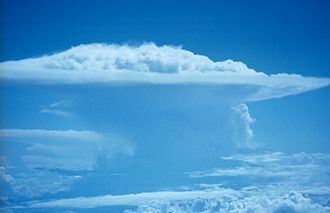 Picture of a pyro-cumulonimbus taken from a commercial airliner cruising at about 10 km. In 2002 various sensing instruments detected 17 distinct pyrocumulonimbus cloud events in North America alone. 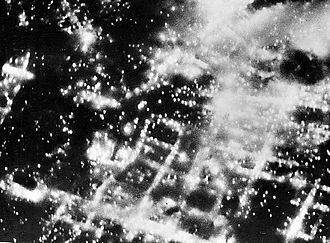 Braunschweig burning after aerial firebombing attack in 1944. Notice that a firestorm event has yet to develop in this picture, as single isolated fires are seen burning, and not the single large mass fire that is the identifying characteristic of a firestorm. Approaching winter storm in Salt Lake City. A blizzard in Goodland, Kansas. Blizzard into Tochal Skiing resort, Tehran and involved skiers. March blizzard in North Dakota, 1966. Conditions approaching a blizzard whiteout in Minnesota, on March 1, 2007. Note the unclear horizon near the center. Freezing ice on aircraft wing.